Here is picture of Jay's racing team. 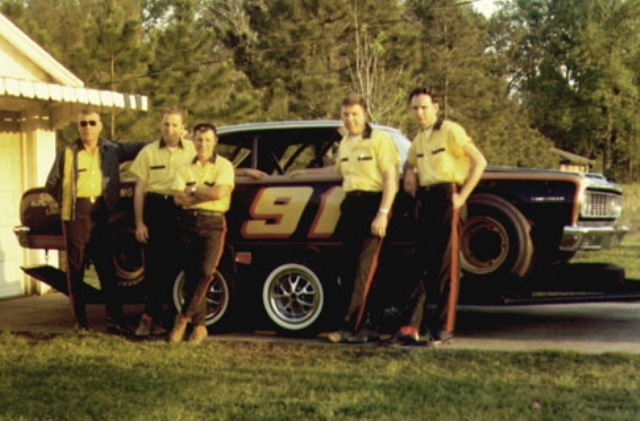 From left to right is Jay Gonzales, Harold Richard, Lloyd "Bap" Cassano, John Ford and Donald Watson. As told by John Ford: I grew up in Jackson in the 50's and my friends and I rode our bicycles many miles on gravel roads at night to the races at Speedbowl Park. We had no money so we relied on getting a job selling cokes, peanuts or programs to get into the race track. Many years later, while living in Baton Rouge, I met Jay Gonzales, who was in the beginning stages of building his first #91 '64 Chevelle. I helped him complete the car and worked on his crew for about 8 years before I moved away from Baton Rouge.